Blisters, calluses and ingrown toenails. All quite gross, and all too familiar if you spend a lot of time in running shoes. Particularly new running shoes that don't know your feet yet. But these things, these nasty things we runners deal with can be quite preventable if 1) the shoe fits and 2) the socks are good. It's OK to be jealous of my Batman socks. The good people behind PowerSox recently sent me a few pairs of their socks to try out. 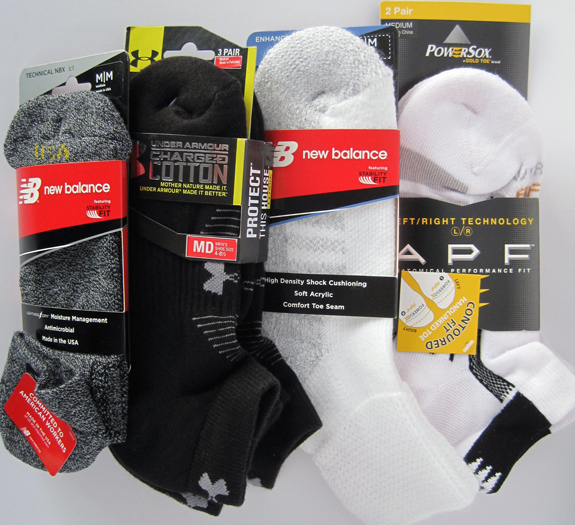 They're the Technical NBX sock, made specifically for elite runners. "The comfort, the function, the achievement are noticed...the sock is not." << Totally agree. I had plenty of room in the toe box, and they felt tight around my arches. My only complaint? I wish they cut lower around the ankle. You'll find that's my complaint on all of the socks featured above. Especially the second New Balance pair. Way too high, way too thick...probably my least favorite of the bunch. For the gym, anyways. I loved wearing them around the house. It was as if I had slippers on. But when I wore them at the gym, I could actually my feet sweating. Next up, the Under Armours. Let me preface this by saying that I'm not usually a fan of black socks, particularly at the gym because the fashionista in me doesn't like how obvious they are up against my blue shoes. So I probably won't put these into the rotation, but they were rather comfortable. They fit smoothly, and left me without any issues contrary to comfort. These would be perfect if they were just a little bit lower at the ankle. Notice the right/left fit. The contoured toe eliminates any bunching you get at the toes in your shoes. I hate that, it's so annoying! 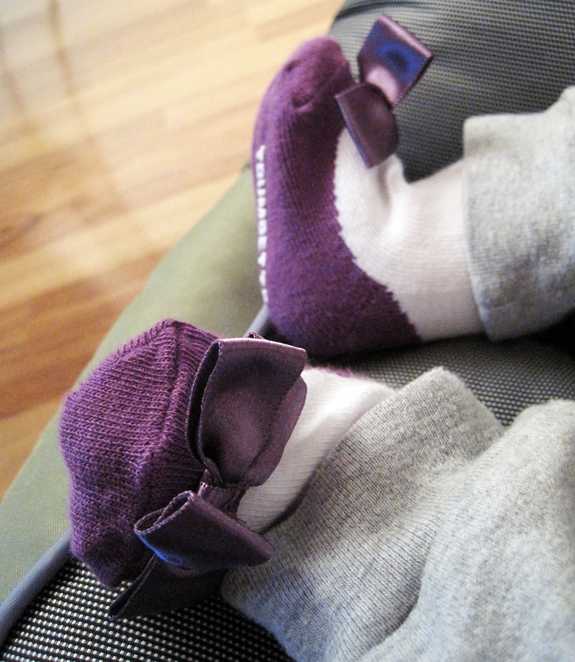 These fit perfectly, and snuggled my feet in all the right places—and kept them dry, too. Bonus points for that. 1) Size. It does matter because one does not fit all. If they're too big, your foot will slide around and the sock itself will bunch up inside your shoe which can affect foot performance—it's true! And if they're too small, they will just annoy you. Heck, they might even make your shoes feel too small. 2) Material. Choose cotton, preferably with some dri-fit action. Wet feet stink, literally and figuratively, and they can lead to things like Athlete's Foot and fungal infections. Fun, right? 3) Arch support. This part of your foot absorbes the shock of running and jumping, so a little support will go a long way. I notice a huge difference when I wear socks with this feature. They're just...way more comfortable. 4) Thickness. Different shoes require different socks. Pick the wrong thickness and your shoes might suddenly feel too small. I know it seems silly to spend a little more on a pair of performance socks, but they really can be worth it. Then again, you have to do what's right for you. Only you can truly determine your own comfort levels. Now, if only my gym socks had bows on them. 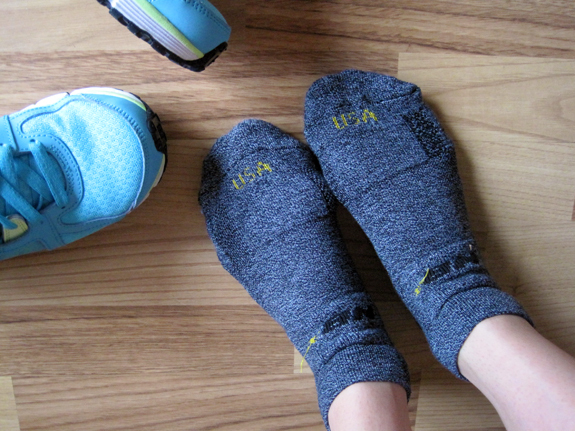 Question: Are you picky about the socks you wear at the gym? If so, how? ENTER MY GIVEAWAY! You just might win a box of Chobani Greek Yogurt! (Contest ends at midnight EST on Tuesday, April 3, 2012).